Hod HaSharon (meaning splendour of Sharon) is situated in south Sharon region, NE to Tel Aviv and South to Kefar Sava. 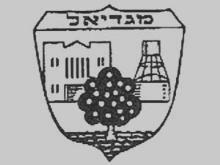 It was established in 1964 by uniting the local councils of Magdiel (municipal emblem was published in the official gazette (Rashumot, Yalkut HaPirsumim), YP 633, 13 November 1958), Ramat Hadar and Hadar Ramatayin (emblem published in YP 690, 30 July 1959). As a joint Local Council its emblem was published in YP 1277, 19 May 1966 and it became a municipality in 1990 without changing its emblem. Pop. 35,000. The flag on the city hall is green with emblem. Emblem on blue was also spotted in the town. Source: author's own observation, 19 September 2001. Hod HaSharon was established by unification of four settlements (Hadar Ramatayin itself was a unification of Ramatayim and Kefar Hadar in 1951. In 1963 also Ramat Hadar was joined without change of the name. "The emblem of the Local Council [then] Hod HaSharon was combined from: Orange tree - which characterized the settlement whose existence was based on agriculture and citrus plants - with four oranges in its top , to represent the geographical position of the four founding settlements in Hod HaSharon map. Cogwheel - to mark the developing industry in the site. There are also the names of the four settlements which united in 1964 to a new one named Hod HaSharon in order of their establishment dates. [the names are hardly visible but those are at the bottom of the shield]." I reported a green flag, but it seems that this is not the only color used as a photo in the municipal site reveals also a yellow variant.